Use the resource tabs, tree mode, or the search function to find and select a host in the results list. Click the Refresh Capabilities button. The list of network interface cards in the Network Interfaces tab of the details pane for the selected host is updated. Any new network interface cards can now be used in the Manager. Click the Network Interfaces tab in the details pane. Click the Setup Host Networks button to open the Setup Host Networks window. Select a Boot Protocol from None, DHCP, or Static. If you selected Static, enter the IP, Netmask / Routing Prefix, and the Gateway. Each logical network can have a separate gateway defined from the management network gateway. This ensures traffic that arrives on the logical network will be forwarded using the logical network's gateway instead of the default gateway used by the management network. 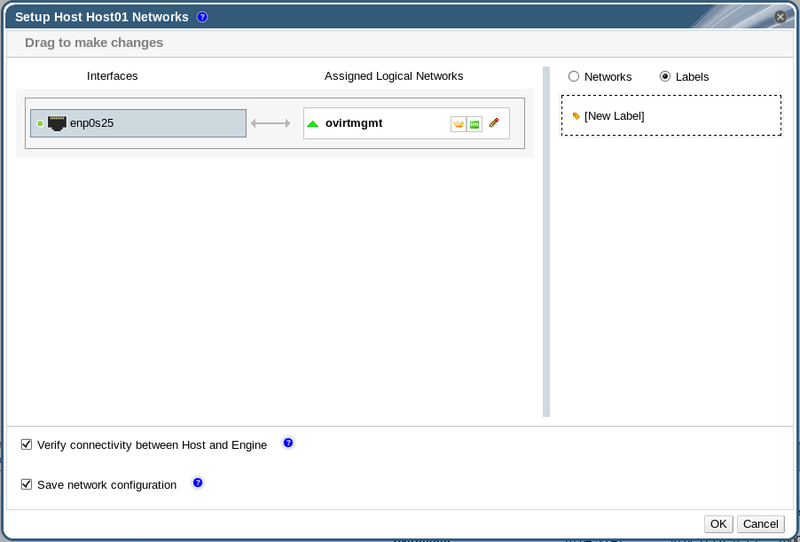 To configure a network bridge, click the Custom Properties drop-down menu and select bridge_opts. Enter a valid key and value with the following syntax: [key]=[value]. Separate multiple entries with a whitespace character. The following keys are valid, with the values provided as examples. For more information on these parameters, see Section B.1, “Explanation of bridge_opts Parameters”. To configure ethtool properties, click the Custom Properties drop-down menu and select ethtool_opts. Enter a valid key and value with the following syntax: [key]=[value]. Separate multiple entries with a whitespace character. The ethtool_opts option is not available by default, and you need to add it using the engine configuration tool. See Section B.2, “How to Set Up Red Hat Enterprise Virtualization Manager to Use Ethtool” for more information. See Red Hat Enterprise Linux 6 Deployment Guide or the manual page for more information on ethtool properties. To configure Fibre Channel over Ethernet (FCoE), click the Custom Properties drop-down menu and select fcoe. Enter a valid key and value with the following syntax: [key]=[value]. At least enable=yes is required. You can also add dcb=[yes|no] and auto_vlan=[yes|no]. Separate multiple entries with a whitespace character. The fcoe option is not available by default; you need to add it using the engine configuration tool. See Section B.3, “How to Set Up Red Hat Enterprise Virtualization Manager to Use FCoE” for more information. If your logical network definition is not synchronized with the network configuration on the host, select the Sync network check box. A logical network cannot be edited or moved to another interface until it is synchronized. The VM Network is different from the physical host network. The VLAN identifier is different from the physical host network. A Custom MTU is set on the logical network, and is different from the physical host network. If not all network interface cards for the host are displayed, click the Refresh Capabilities button to update the list of network interface cards available for that host. Click the Hosts resource tab, and select in the results list a host associated with the cluster to which your VLAN-tagged logical networks are assigned. Click the Network Interfaces tab in the details pane to list the physical network interfaces attached to the data center. Click Setup Host Networks to open the Setup Host Networks window. Edit the logical networks by hovering your cursor over an assigned logical network and clicking the pencil icon to open the Edit Network window. You have added multiple VLAN-tagged logical networks to a single interface. This process can be repeated multiple times, selecting and editing the same network interface each time on each host to add logical networks with different VLAN tags to a single network interface. Click Labels, and right-click [New Label]. Select a physical network interface to label. The Red Hat Enterprise Virtualization Manager Administration Portal allows you to create bond devices using a graphical interface. There are several distinct bond creation scenarios, each with its own logic. Are either of the devices already carrying logical networks? If the bond devices are not attached to logical networks, or are attached to compatible logical networks, a new bond device is created. It contains all of the network interfaces, and carries all logical networks, of the component bond devices. The Create New Bond window is displayed, allowing you to configure your new bond. Modes 1, 2, 3 and 4 support both virtual machine (bridged) and non-virtual machine (bridgeless) network types. Modes 0, 5 and 6 support non-virtual machine (bridgeless) networks only. Transmits packets through network interface cards in sequential order. Packets are transmitted in a loop that begins with the first available network interface card in the bond and end with the last available network interface card in the bond. All subsequent loops then start with the first available network interface card. Mode 0 offers fault tolerance and balances the load across all network interface cards in the bond. However, Mode 0 cannot be used in conjunction with bridges, and is therefore not compatible with virtual machine logical networks. Sets all network interface cards to a backup state while one network interface card remains active. In the event of failure in the active network interface card, one of the backup network interface cards replaces that network interface card as the only active network interface card in the bond. The MAC address of the bond in Mode 1 is visible on only one port to prevent any confusion that might otherwise be caused if the MAC address of the bond changed to reflect that of the active network interface card. Mode 1 provides fault tolerance and is supported in Red Hat Enterprise Virtualization. Selects the network interface card through which to transmit packets based on the result of an XOR operation on the source and destination MAC addresses modulo network interface card slave count. This calculation ensures that the same network interface card is selected for each destination MAC address used. Mode 2 provides fault tolerance and load balancing and is supported in Red Hat Enterprise Virtualization. Transmits all packets to all network interface cards. Mode 3 provides fault tolerance and is supported in Red Hat Enterprise Virtualization. Creates aggregation groups in which the interfaces share the same speed and duplex settings. Mode 4 uses all network interface cards in the active aggregation group in accordance with the IEEE 802.3ad specification and is supported in Red Hat Enterprise Virtualization. Ensures the distribution of outgoing traffic accounts for the load on each network interface card in the bond and that the current network interface card receives all incoming traffic. If the network interface card assigned to receive traffic fails, another network interface card is assigned to the role of receiving incoming traffic. Mode 5 cannot be used in conjunction with bridges, therefore it is not compatible with virtual machine logical networks. Combines Mode 5 (adaptive transmit load balancing policy) with receive load balancing for IPv4 traffic without any special switch requirements. ARP negotiation is used for balancing the receive load. Mode 6 cannot be used in conjunction with bridges, therefore it is not compatible with virtual machine logical networks. You can bond compatible network devices together. This type of configuration can increase available bandwidth and reliability. You can bond multiple network interfaces, pre-existing bond devices, and combinations of the two. A bond can also carry both VLAN tagged and non-VLAN traffic. Click the Hosts resource tab, and select the host in the results list. Click the Network Interfaces tab in the details pane to list the physical network interfaces attached to the host. If the devices are incompatible, the bond operation fails and suggests how to correct the compatibility issue. Bonding modes 1, 2, 4, and 5 can be selected. Any other mode can be configured using the Custom option. Optionally choose to Verify connectivity between Host and Engine and Save network configuration. Click OK accept the changes and close the Setup Host Networks window. Your network devices are linked into a bond device and can be edited as a single interface. The bond device is listed in the Network Interfaces tab of the details pane for the selected host. Use the following procedure to change the fully qualified domain name of hypervisor hosts. Place the hypervisor into maintenance mode so the virtual machines are live migrated to another hypervisor. See Section 6.5.7, “Moving a Host to Maintenance Mode” for more information. Alternatively, manually shut down or migrate all the virtual machines to another hypervisor. See Manually Migrating Virtual Machines in the Virtual Machine Management Guide for more information. Edit the /etc/sysconfig/network file, update the host name, and save. In the text user interface, select the Network screen, press the right arrow key and enter a new host name in the Hostname field. Select <Save> and press Enter. Re-register the host with the Manager. See Manually Adding a Hypervisor from the Administration Portal in the Installation Guide for more information. Log in to your Hypervisor as the admin user. Press F2, select OK, and press Enter to enter the rescue shell. Restart the network service and verify that the IP address has been updated. Type exit to exit the rescue shell and return to the text user interface.